Thank you to my initial backers! We've hit our First kickstarter goal! Hi! Thanks for your support! Please help make this DVD even better by sharing with your online friends and community. There is much more value in the number of people supporting this project, then the number of dollars raised. One person can help educate one entire elementary school about allergies! 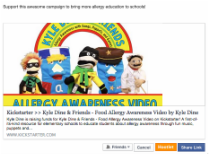 Together lets support allergy education in schools! So, please take a few seconds to share the love about Kyle Dine & Friends.